The Phillies added a trio of prospects to their 40-man roster on Tuesday, consequently protecting them from being plucked by another organization in next month's Rule 5 draft. The organization added hurlers Adonis Medina and Edgar Garcia, along with shortstop Arquimedes Gamboa. 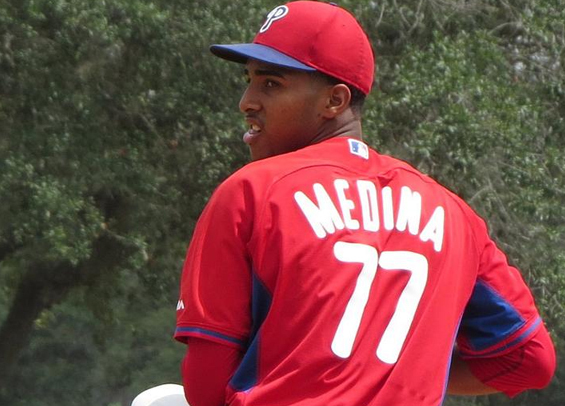 Medina, 21, is the organization's second-best pitching prospect behind Sixto Sanchez. The right-hander finished 10-4 last season in Single-A Clearwater, compiling a 4.12 ERA. He accumulated 123 strikeouts over 111 innings of work and showcased a fastball that routinely sat in the mid-90s with movement. Garcia, 22, split time last season between Double-A and Triple-A and finished with a 3.64 ERA in his first full season converted to a reliever. He struck out 72 batters and walked just 27 in 64 1/3 innings. Gamboa, 21, hit just.214 with a .304 on-base percentage with high-A Clearwater last season. Though he struggled at the plate, he demonstrated flashes of brilliance in the field with an above-average arm. The additions bring the Phillies to 38 players on the 40-man roster, though this includes Justin Bour whom multiple sources and outlets have reported as clearing waivers. One particular surprise with the additions to the 40-man roster was the omission of right-hander Tom Eshelman. The 24-year-old was honored in 2017 as the organization's best minor-league pitcher but faltered significantly in 2018. He pitched to a 5.84 ERA in 140 1/3 innings with Triple-A Lehigh Valley and was lit up by opposing hitters who hit .321 off of him. The Rule 5 draft will take place next month in Las Vegas at the Winter Meetings.